Step-out hole RSC-188 intersected 0.45 grams of gold per tonne ("g/t Au") over 114.0 metres, demonstrating gold mineralization, brecciation and alteration continue to the west of North Stock. 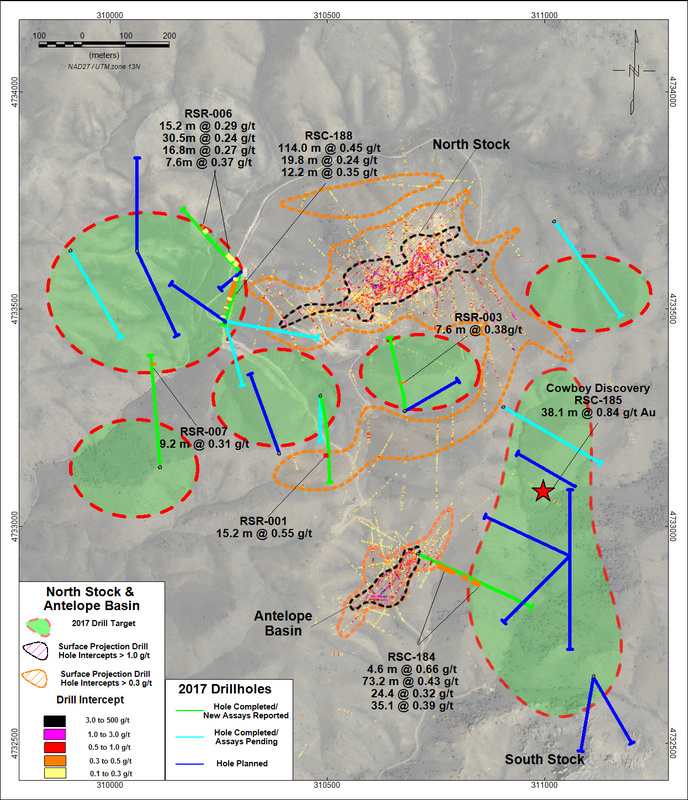 RSC-184 extended gold mineralization at Antelope Basin 200 metres to the east towards the Cowboy target with an intercept of 0.42 g/t Au over 73.2 metres. Drilling between the North Stock and Antelope Basin deposits outlined several intervals of low grade mineralization, outlining the potential to link the two deposits. Drill results at Blackjack intersected thick zones of gold-silver mineralization, highlighted by hole BJR-005: 0.79 g/t Au and 36.86 grams of silver per tonne (g/t Ag) over 18.3 metres and 0.36 g/t Au and 10.62 g/t Ag over 53.3 metres that demonstrate the system remains open to the west. The Company has completed approximately 50% of the 2017 drill program with 14 holes pending assay results and expects to complete the program in November. Greenfield drilling is expected to begin in October. 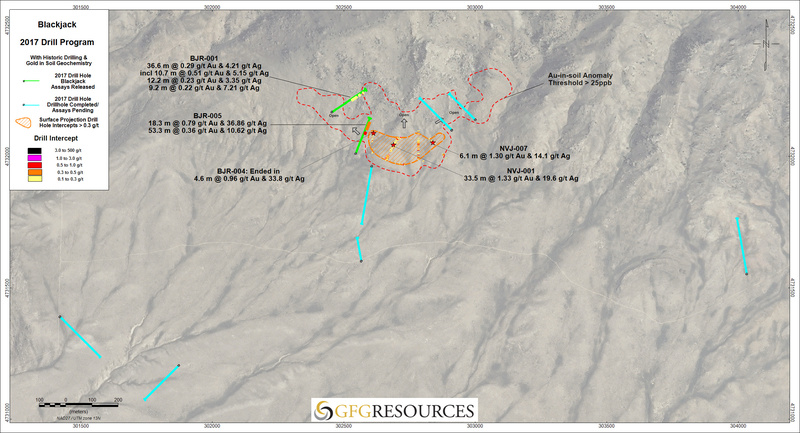 GFG Resources Inc. (TSX VENTURE: GFG) (OTCQB: GFGSF) ("GFG" or the "Company") announces initial drill results from its 15,000 metre or 50-hole drill program at its 100% controlled, Rattlesnake Hills Gold Project in Wyoming, United States. These initial eight drill hole results (See Table 1) are from testing brownfield targets proximal to the North Stock, Antelope Basin and Blackjack areas (See Figures 1 and 2). The Company is very encouraged by the initial results as all the holes intersected broad zones of gold mineralization and demonstrate that the targeted areas remain open. "Our objective over the last year has been to take an aggressive, district scale exploration approach by testing beyond the borders of historic drilling and to test the district for a new discovery with six greenfield targets. The most important factor to date, is that wherever we have drilled, we have intersected gold mineralization with key geological markers present. The district as whole remains prospective and we are confident that further drilling will demonstrate a much larger system," stated Brian Skanderbeg, President and CEO. 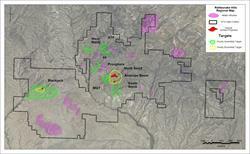 "Drilling was successful at extending the North Stock deposit to the west with hole RSC-188. We continue to intercept well mineralized and strongly altered heterolithic breccias in step-out holes testing the western extension and we believe that the system can be extended and potentially link with our Pronghorn and MGT regional targets. 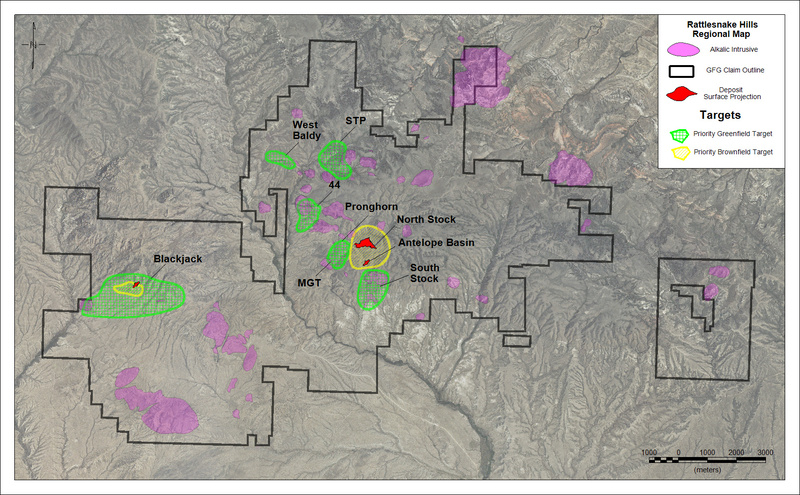 We were also able to expand the mineralization at Antelope Basin to the east towards the Cowboy target. We believe that the Cowboy target is a sub-parallel zone to Antelope Basin and we will complete another seven holes in that area this year. With most of the program assays yet to be announced, we look forward to providing further results to demonstrate the potential of the district. In October, we will begin testing our greenfield targets; all of which are kilometer in scale and show strong similarities to the North Stock and Antelope Basin systems." Table 1: Initial 2017 Drill Results from Rattlesnake Hills Gold Project. *Gold intervals reported in the above table are based on a 0.20 g/t or 0.50 g/t Au cutoff and may include waste or low-grade intervals of up to six metres. Weighted averaging has been used to calculate all reported intervals. True widths are estimated at 60-100% of drilled thickness. 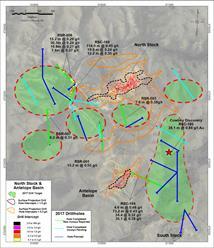 RSC-184 was drilled in the flank of Antelope Basin deposit to test for sub-parallel zones east of the historic drilling. The lithologies were primarily schist and monolithic schist breccia and the gold mineralization was associated with moderate to strong carbonate and weak to moderate potassic alteration. This hole is significant as there is no proximal drilling and it intersected thick zones of mineralization, hosted in Precambrian schist, that extend nearly 200 metres east of the quartz monzodiorite dike that hosts mineralization at Antelope Basin. RSC-188 was drilled on the west side of the North Stock intrusion and was 70 metres from the nearest historic drill hole (Hole RSC-149: 0.61 g/t Au over 86.9 metres). The hole intersected thick intervals of heterolithic breccia, phonolite and monolithic schist breccia before ending in Precambrian schist. The thick zone of gold mineralization (74.07 metres to 188.06 metres) confirms this extension and suggests that the mineralization continues towards the west and remains open. The alteration in this intercept included moderate potassic (adularia) flooding and moderate to strong pyrite. In addition, the lower intercept (333.15 metres to 349.91 metres), while lower grade, showed the contact zone between the Eocene volcanic breccia and the Precambrian schist is mineralized. This is similar to some of the mineralization seen in the Cripple Creek Mining District where this contact acted as a favorable conduit for fluids. RSR-001 and RSR-003 tested the middle ground area between Antelope Basin and North Stock. Lithologies in both holes were largely schist, but the lower portions of RSR-003 intersected heterolithic breccias and phonolites below 240 metres where the intensity of the potassic alteration increased. The results suggest mineralization continues to remain open towards the west where additional holes have been planned and permitted. The Company will continue to drill in this area using core holes to better test the targets and explore the linkage between the two deposits. RSR-006 was designed to test the northwestern extension of the mineralization at North Stock. The hole intersected lithologies that varied from phonolites, heterolithic breccias and schist with the better grades hosted in the breccia units. While the hole intersected thick zones of low grade mineralization, it also intersected some of the strongest alteration seen in the program with moderate to strong pervasive potassic alteration and associated carbonate alteration. This type of alteration is an important geological marker for gold mineralization in the district. RSR-007 tested a strong IP anomaly 350 metres southwest of North Stock. The hole was drilled entirely in schist. The gold intercept reported near the bottom of the hole was associated with a zone of weak to moderate potassic alteration. The results showed low-grade mineralization associated with the IP anomaly and the Company has plans to further test the target in 2017. BJR-001 and BJR-005 were designed to test the western portion of the large (400 metres by 750 metres) gold-silver soil geochemistry anomaly at Blackjack. Both holes intersected Precambrian granites with minor quartz veins. The gold was associated with zones of weak to moderate pyrite in BJR-001 while the mineralization in BJR-005 was found in zones with moderate to strong pyrite and potassic (adularia-quartz) alteration. It is important to note that BJR-005 hosted significant silver mineralization which included 36.86 g/t Ag over 18.3 metres and 10.62 g/t Ag over 53.3 metres. The holes are significant as they intersected thick zones of mineralization which remain open to the west with results pending on a number of proximal holes. To date, the Company has completed 50% of its 2017 drill program with approximately 14 holes pending assay results. The remaining 25 drill holes consist of an additional 10 brownfield holes and approximately 15 greenfield holes. Drilling on the greenfield targets is expected to begin in October. Based on current productivity rates, the Company expects to complete the drilling program in early November. Results from the 2017 drilling program are expected to be announced on a monthly basis for the remainder of the year and potentially into 2018. In addition to the drill program, further metallurgical testwork and geological and resource modelling will be completed to support a maiden National Instrument 43-101 resource estimate that is expected to be announced in the first half of 2018. Brian Skanderbeg, P.Geo. and M.Sc., President and CEO, is the Qualified Person for the information contained in this press release and is a Qualified Person within the meaning of National Instrument 43-101. GFG Resources Inc. is a publicly traded precious metals exploration company headquartered in Saskatoon, Saskatchewan, Canada, whose shares trade on the TSX Venture Exchange (GFG) and on the OTCQB (GFGSF). The Company controls 100% of the Rattlesnake Hills Gold Project, a district scale gold exploration project located approximately 100 kilometres southwest of Casper, Wyoming, U.S. The geologic setting, alteration and mineralization seen in the Rattlesnake Hills are similar to other gold deposits of the Rocky Mountain alkaline province which, collectively, have produced over 50 million ounces of gold.